I had a home day recently when Mr 2.5 was sick. He doesn’t really have an attention span so it makes it quite difficult to keep him entertained. By 9am we had played trains, blocks and watched Thomas the Tank Engine. He ‘helped’ me with the laundry and he wasn’t interested in stories. He was getting bored. And whingy. I need to think fast to keep him entertained for my sanity’s sake as it was still a good three hours until nap time. 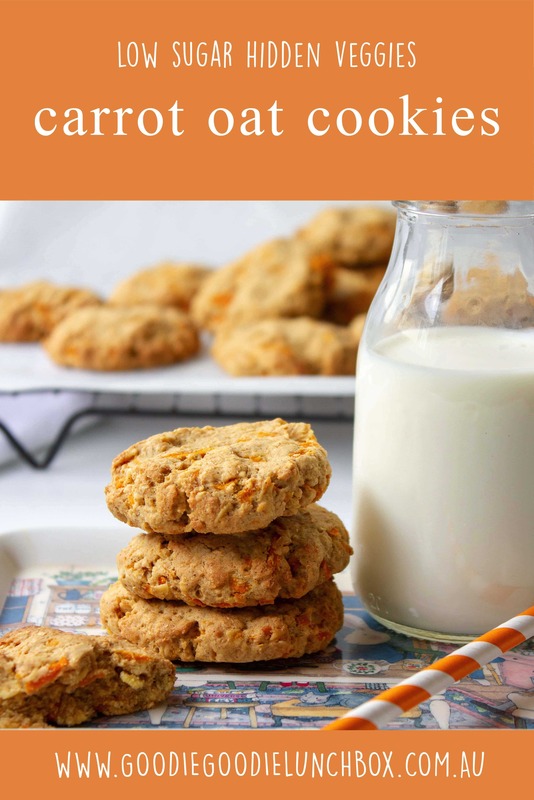 We decided to do some baking which we both love to do and we made these delicious Carrot Oat Cookies together. You get to eat what you make. Quite possibly my favourite reason. There is so much your children can help you with when baking. While making these Carrot Oat Cookies Mr 2.5 helped use the mixer, add the measured ingredients into the bowl and stir the dough together. He also helped roll the dough into balls, not to much success but he tried none the less. When Mr 6 bakes with me he can also assist with with measuring, cutting fruit and he also helps crack the eggs. The more you bake with your children the more competent and confident they will be. A few tips with baking with children. Get everything that you need out and ready, ingredients, measuring and stirring spoons, bowls and patience. Do not forget your patience. Expect that spills will happen. There will be fingers and egg shells in the mix. And that is OK. 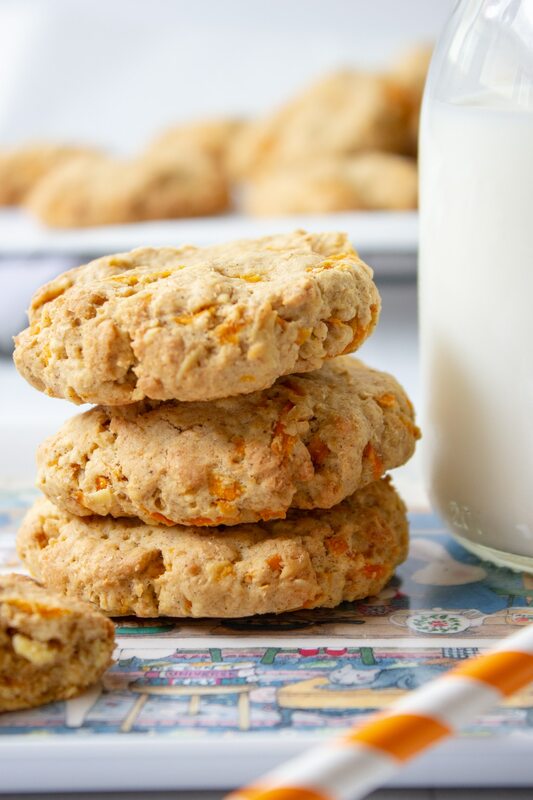 These low sugar flavoursome Carrot Oat Cookies are perfect for school lunches or snacks. 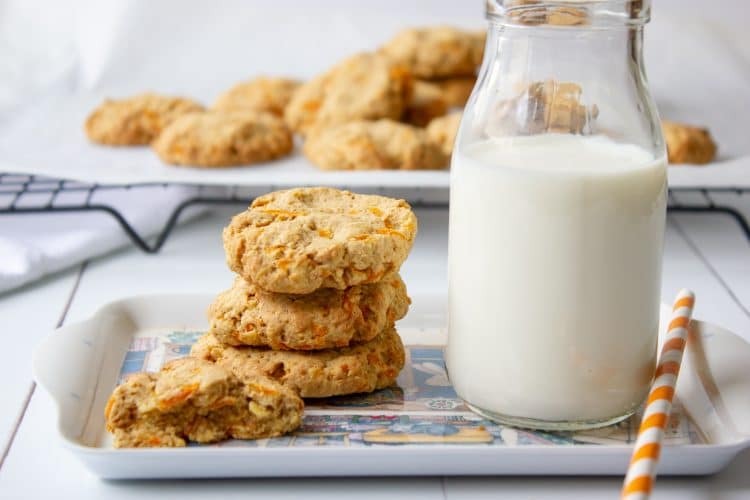 I am loving getting in extra vegetables where I can so I love these Carrot Oat Cookies for the lunchbox. If you are looking for other recipes to get some vegetables in the lunchbox why not try my Pumpkin and Coconut Muffins or these Carrot Cheddar Poppy Seed Crackers. 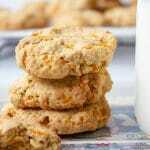 These Carrot Oat Cookies are also a good fibre source from the oats and wholemeal flour. 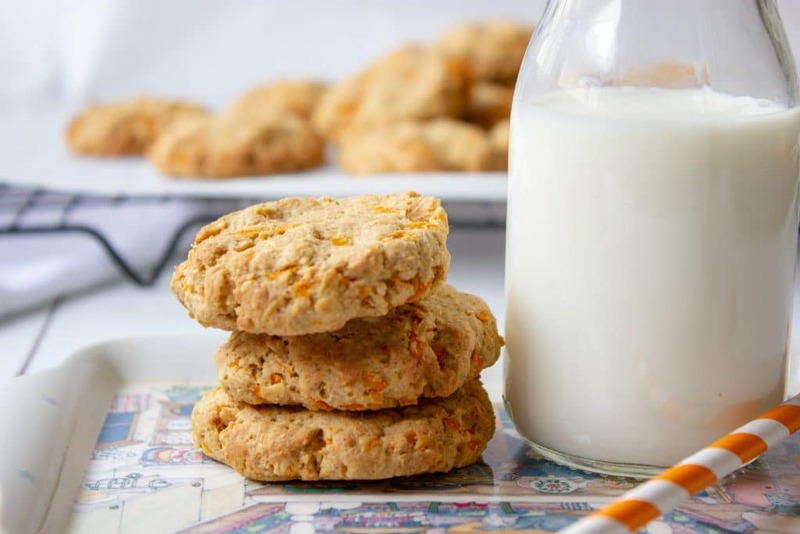 The Carrot Oat Cookies are delicious, they are light and slightly chewy. It couldn’t get any easier to feed your kids carrots! I am sure your family will enjoy them as much as we do.